This seems basic, and it’s probably just the weed clouding my thought process but here goes. Science fundamentals question here. 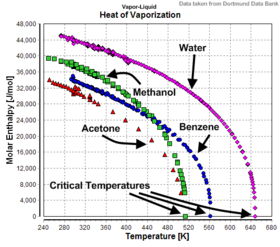 But I’ve been noticing the differences with vapor pressure/volatility of chemicals and the energy to evaporate (I.e heptane boils higher than ethanol but needs less energy to Evaporate). I’m curious how this relates to condensing the gas. If I had a 5kw chiller, would it condense the same amount of fluid? Is there a direct relationship between the condensing and evaporating energies required? Do you condense more of a high volatility gas in the same condenser? Also, if you had a certain size of condenser are you more or less likely to over-run it as a function of vapor pressure? energy required for phase change is the same in both directions. it takes more energy to evap (or condense) a liter of water than a liter of ethanol. same for ethanol vs heptane. Do you think that it might take a bit more energy to evaporate an ethanol solution than it takes to condense it based on the different inter-molecular forces being different with the presence of cannabinoids and other components? I dont imagine the difference would be very large, just a thought. however, from what I’ve seen, most folks oversize their condenser slightly when compared to their evaporator. if at first it doesn’t evaporate, (you can) try try again. as a biologist I guess and iterate. just like the intelligent designer seems to.